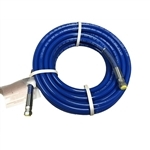 SAE 100R17 Hose - 3,000psi 1/4 to 1/2"
The key ingredient of pressure washer hose assemblies is the pressure. Having difficulty finding a custom hose that provides you with the power you need to complete your task? You have come to the right place. Hose and Fitting Supply has an assortment of hydraulic hose assemblies for you to choose from, powerful and durable tools with as much as 3,000 pounds of force per square inch. For a heavy duty job, look no further. See the individual hose assemblies above for additional details. Once you have selected the right pressure hose for you, enter in the coupon codes on our home page to save big. Have questions about orders or hydraulic hose assemblies? Call 952-797-6850 to speak to one of our fitting specialists today!